Some of my favorite meals to make are the ones that you literally throw together on a Thursday night and they turn out amazing! That is kinda what happened with this Easy Orecchiette with Broccoli and Italian Sausage Recipe. While you are waiting for the water to come to a boil, cut your broccoli into bite-sized florets. Add the broccoli to a DEEP pan and add salt, pepper, and 1 cup of water. Once the water has come to a boil, cover and steam for 6-10 minutes until fork tender. While the broccoli is steaming, you will need to remove the sausage from the casing. By this time your pasta water should be boiling so you can add the orecchiette and cook according to the directions on the package. Once the broccoli is fork tender remove it from the pan and sit to the side. I would also like to point out that if there is water left in the pan that is fine. Just leave it. Now add the sausage, garlic, and chili flake to the pan and cook until browned and no longer pink. Once the sausage is fully cooked, return the broccoli to the pan. When the pasta has finished cooking, drain and add to the pan with the sausage and broccoli. Toss everything until it is coated with the cheese and pesto. Top with a little extra parmesan cheese, serve, and enjoy! 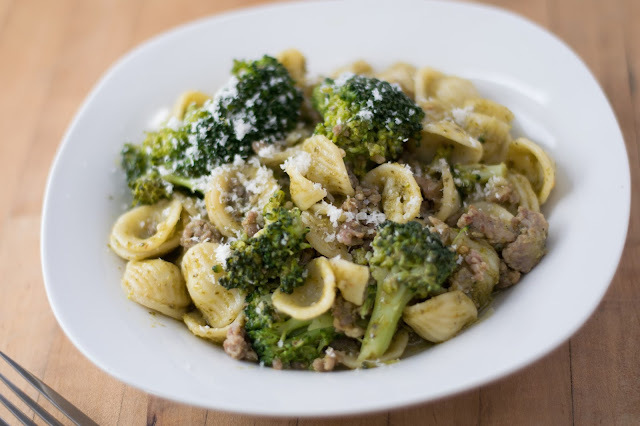 This Easy Orecchiette with Broccoli and Italian Sausage Pasta Recipe couldn't be more simple and the flavor is out-of-this-world! I know you and your family are going to love it so get in the kitchen and give it a try TONIGHT! Place a pot of salted water over high heat and bring to a boil. Place the broccoli into a DEEP pan, season with a little salt and pepper, and add 1 c of water. Bring the broccoli water to a boil, cover, and steam for 6-10 minutes, until fork tender. 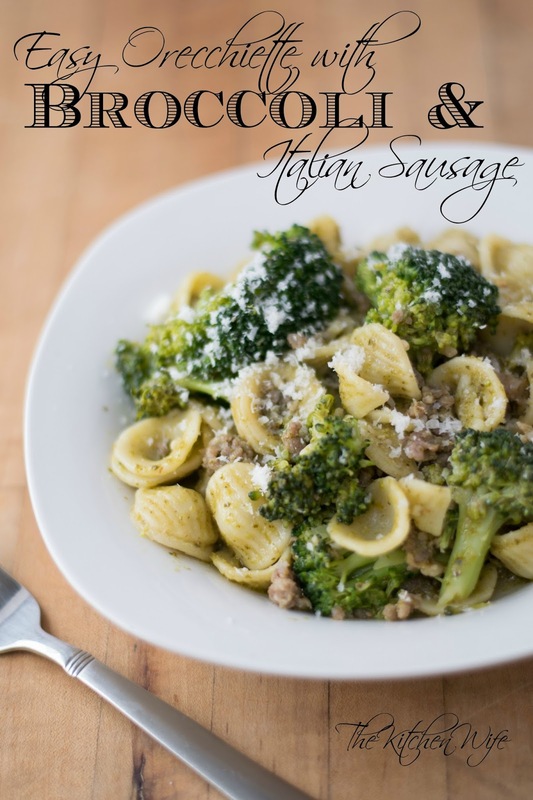 While the broccoli is steaming, remove the Italian sausage from the casing. By now the pasta water should be boiling so add the orecchiette. Add the sausage, garlic, and chili flake to the pan and cook until browned and no longer pink. When the pasta is finished cooking, drain and add the pan with the sausage and broccoli. Add the parmesan cheese and pesto to the pan and toss everything until it is coated. Top with a little extra parmesan, serve and ENJOY! truly looks wonderful. I am going through my freezer and pantry this week trying to use up some items that I need to before they get too old or are not right to eat in the summer. I am adding this recipe to my list. Thanks. Awesome! I have been doing a lot of that myself! Trying to get ready for all the gorgeous fresh veg in the summer!!! Absolutely delicious. Thank you for sharing this healthy recipe. Thank you for showing so much love to my blog! I am always open to suggestions and requests so let me know if there is anything you would like to see!